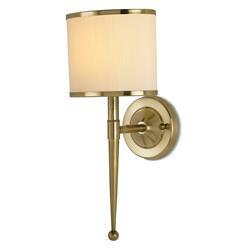 Set a modern mood with this understated, sleek brass wall sconce. Long, thin lines add ambiance to any area. A cream colored linen shade is tipped in brass to complete the luxurious look.